Countless free to play games have launched and failed, and this is a constant regret many game teams have. They should have done more in the beginning to think about monetization. They should’ve been thinking a lot deeper about how their game was going to make money instead of just making a good game. Learning how to evaluate monetization early is difficult. Most resources talk about clever monetization mechanics (ex. 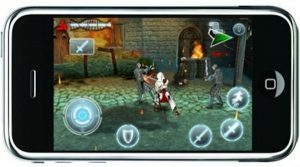 Pricing of in-app purchases, limited time offers, VIP systems, sales, etc.) but rarely is there much information about how to tell if your early prototype has what’s necessary to eventually monetize. The common remark to monetization is that good monetization can only come from good retention, as if just making a fun game will inherently make your game monetize. Anyone that’s launched a free to play game knows this isn’t completely correct. The truth is that monetization and retention are strongly interconnected and you need to think about both as early as possible within your game. Monetization is not something that you can stumble into if you want to compete on the AppStore. Completing these 3 steps will allow you to set up your game to monetize to its full potential. Step 1: What are you Selling? Every top grossing free to play game primarily sells the means to progress. Progress is the strongest driver of monetization. The top grossing games don’t sell content (ex. DLCs), they sell progress towards an end game. Progress comes in many forms and sizes. It could mean moving forward on a map. Progress could mean building up a farm. Progress could mean collecting and upgrading characters. To start, you need to define what progress means for your game. Candy Crush’s core progress is to move forward on a map. 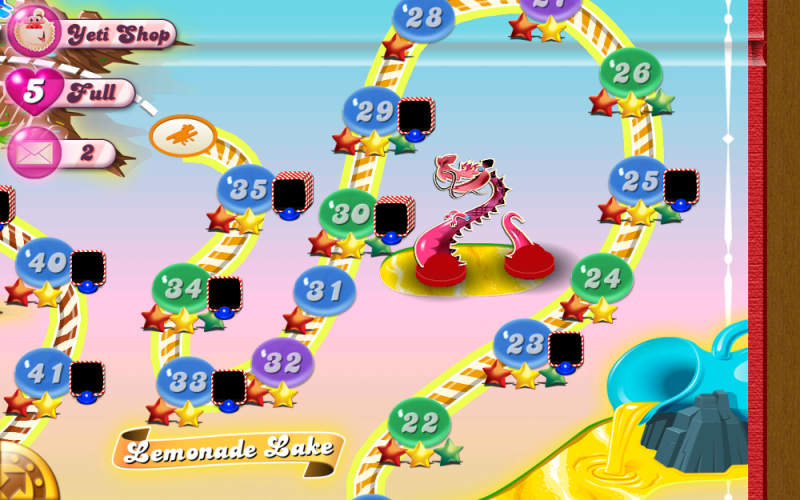 Candy Crush focuses all of their monetization mechanics to help progress on the map. They sell boosts, extra moves or charms which all help you progress. Galaxy of heroes is all about upgrading & collecting heroes. Each game mode promotes the need to have a large collection of characters. As the game progresses, it demands an increasing upgrade level of your characters, requiring you to progress. They sell the means to progress faster: currencies to train your characters, the ability to fight battles instantaneously, and loot cards to unlock characters faster than your normally can. Every top grossing game has a long path of progress which is the main focus of their monetization. You must define the core progress for your game. What do you see players building over a long period of time? 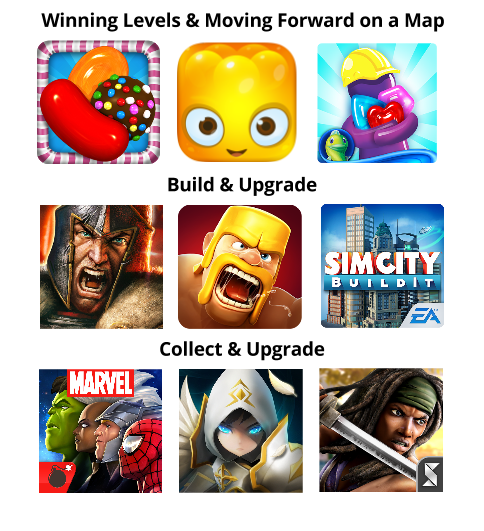 For each of these games, this core progress is the central focus of their monetization strategy. All monetization mechanics give options for the players to speed up their progress. When you’ve discovered what your core progress is — what the key central point you are going to be selling — then you can start designing monetization mechanics that speed up the player’s progress in interesting ways. 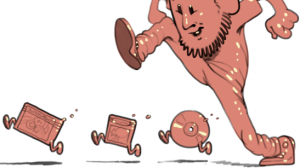 You can start designing mechanics that pace the player’s progress giving you opportunities to monetize. But there is one important step you need to do before you can start creating monetization mechanics: you need to ensure this core progress will actually last. Otherwise you won’t be selling progress for very long. Step 2: How long will it last? What you are selling must be able to scale for years. It doesn’t matter how many monetization tricks you’ve got in your game. If what you’re selling won’t last, you won’t be successful. This is usually where systems begin to show weakness. Not many systems can last for years. Many of the games that we all loved growing up were great games, but only lasted 10 or 20 hours before the system would crack. These games aren’t well suited for free to play. An example of this happened when I was working on a racing game prototype. The core of the game was to race against an opponent to the finish while avoiding obstacles. Our core progress was upgrading your car (similar to CSR Racing). The player collected loot from races to purchase upgrades which would improve their car’s stats. 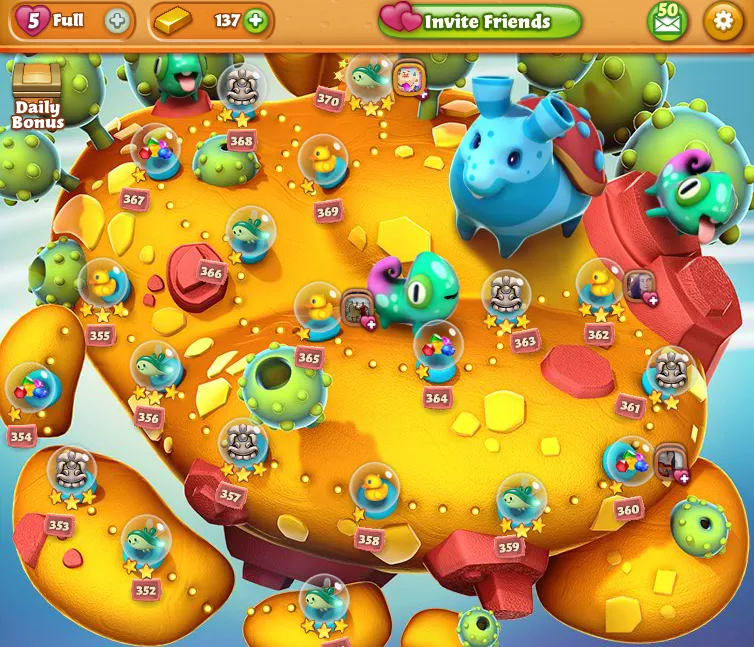 To progress in the game, the player needed higher and higher stats. The key stats to progress were: Speed, Handling, Acceleration and Boost/Nitro. As we tested out the game, we noticed: the more you improved the Speed stat, the harder the game became. The player’s cars were moving faster, which meant that the obstacles were becoming harder to avoid. We had a very limited cap that the speed could be upgraded to without demanding way too much skill from players. With this cap in mind, we tried many things to avoid the issue. We made all obstacles travel with the player based on the player’s speed to make high speeds more manageable (instead of stationary obstacles, we switched to cars driving with the player on a highway). We adjusted the opposing AI’s speed based on your upgrade level to ensure that each upgrade was necessary. We tried many weird tricks to get the system to work, but all of them fell apart and were making the gameplay feel confusing. In the end, the cap on our speed stat wasn’t high enough. In order for the game to be successful we needed the cars from the beginning of the game to be much, much slower than the cars at the end of the game. If we wanted the end of the game to take a months to reach, yet each upgrade along the way to feel meaningful to progress, the “Speed” stat was just not going to work. This was a signal that our system wasn’t going to scale, and our game was not going to work as free to play. Compare this Speed stat problem to a regular RPG system with Health and Attack. This system can scale almost infinitely. A 200 HP monster when you have 20 attack is the same as a 200,000 HP monster when you have 20,000 attack. Attack and Health counter each other, allowing both to grow infinitely large. Speed had no counter stat, which made its growth eventually constrained. This is why many free to play games rely on an RPG system of Health vs Attack (ex. Clash Royale, Clash of Clans, Best Fiends, Puzzles and Dragons, Summoner’s War) this simple system can scale. Look at your base gameplay — do the stats scale? Health vs Attack: The infinitely scalable system that many of the top free to play games use. So how do you apply this to an early prototype? How do you ensure that your system will last? Modelling your game’s economy and progress early is an easy way to give you a sense of just how much content you need and how to pace your game. Exactly how to do this is a very deep topic that I’d love to cover some day. If you don’t have the skillset on your team to model your economy with a tool like Excel, then you need to get someone who can. Without modelling, it is impossible to see just how you’re going to get your game to last. But what should the goal be? How long should your game’s progress last? 10,000 hours or $10,000 dollars: that’s how long your system should last. This of course is just a high level estimate (and easy to remember) but this is a good goal to have if your looking to reach the top grossing charts. Looking at the top games today, they easily go beyond these numbers. Games like Clash of Clans support purchases larger than $10,000 in their games. In comparison to Game Of War, this economy can support a purchases by a single user of over $120,000. These are insane values, but to give you a sense of just how long lasting and resilient these economies are. There is a lot of room in these economies to monetize. With this model, you have a great tool to show what it will take to last. Compare your model against the models of your competitors in your genre and you’ll have even greater benchmarks for how much content you will need. If you want to beat the competition, your game has to last longer. In the beginning, do player progress quickly? Is each progress step desirable and felt as required by the player? Is this beginning of the game still engaging or have you taken away too much of the depth? Is the gameplay easy to get into? In the midgame, has it sufficiently changed from the beginning game? Does it feel like the game is getting deeper? In the end game, does the game still work? Is the amount of skill required to succeed still feel achievable to all of your player types? Is the end game sufficiently complex and deep? How does my end game depth compare to my competitors? Is there a dominant strategy, or do you see your end game players debating over best choices? There are many more questions to ask to ensure the depth of gameplay is there at each stage, but these 3 prototypes can give you a better sense that progress is happening and that your game will work at these 3 stages. This will ensure that the progress that you will be selling is desirable, and that the end game is worth reaching. Using a model and effectively testing your game at multiple stages in the game is the basics of how to prove your game can last. When your game can last, then you now have the necessary base of a game that can monetize. Now it is time to start driving desire to spend. Step 3: Why do I care? You’ve got a core system that can last for years, and a clear definition of what you are selling. All that doesn’t matter if players have no desire to progress. As free to play games, we are selling virtual items. In reality these things have no value. Our job as game designers is to create systems which create value for our virtual items. When our virtual items have value, we are much more likely to monetize. The majority of free to play games use visual progress cues to create a sense of value as you progress through the game. Visual progress can come in many forms, but it must showcase your progress thus far as well as tease future progress. Showcasing your previous progress gives value to your work so far. Gives you real value for your playing time or payments in the past. Teasing the future content gives the “carrot on the stick”. Shows players that there is lots more to come, and hopefully entices them to discover the new content still awaiting them. The Saga map in puzzle games clearly shows the visual progress of the player. Each time you complete a level, you progress on the map. At any time in the future you can scroll through the map and feel good about the progress you’ve made. At the same time it clouds over the future worlds and hints at the mountain of content yet to come, giving you a reason to continue playing to discover the content. 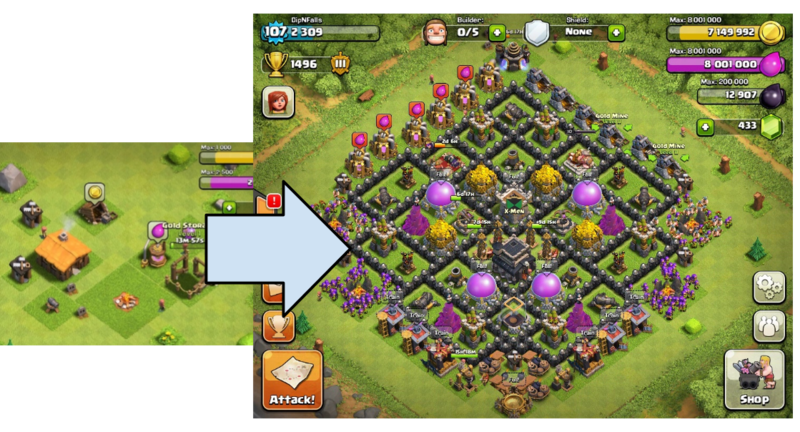 Clash of Clans and almost every game like it with a city/base-building component has this to create greater visual progress to the user. Looking at an early level base in Clash of Clans to a late base really shows just how far a player has come. Each time they enter the game they are reminded of their progress. Each base also feels completely customizable and your own. You decide where each piece of wall goes. This creates more attachment to the visual progress — this is your own base. On top of this, players are teased each time they preview a greater opponent. They can look at the top of the leaderboards and be tempted by how amazing the bases look near the end game. 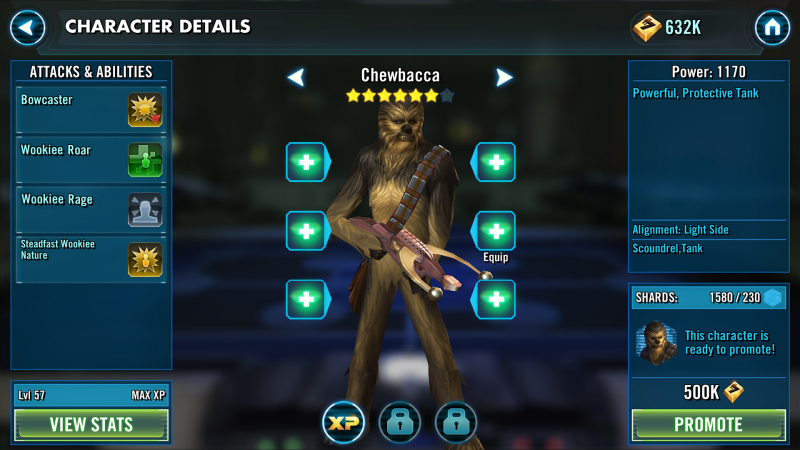 Looking at your character list in Galaxy of Heroes is the best way to see your progress and be teased of the future content. You can see each of your characters and how amazing they are. This showcases their value. Just below your characters, you can see transparent versions of the characters you have yet to unlock, enticing you of the future progress pulling you along. 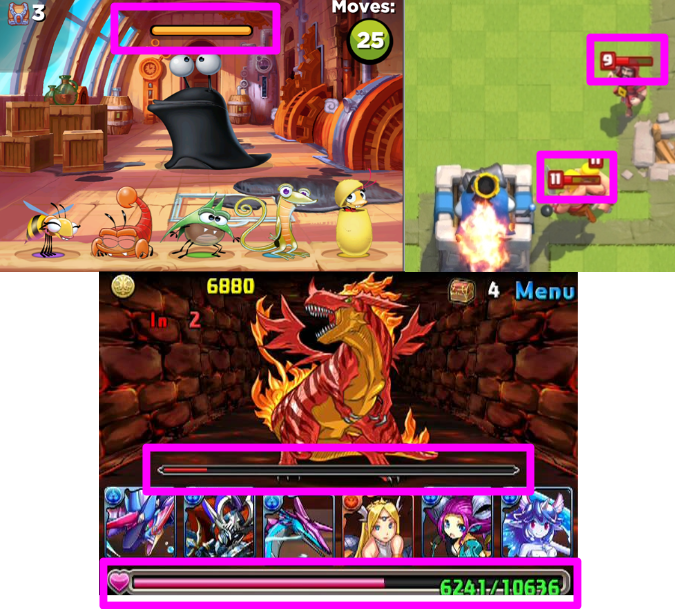 These 3 examples show how the top grossing games use visual progress to create value and desire. Each are also tightly tied to what the core progress is for the game itself. When your core progress is visual, players are much more likely to feel like it is valuable and worth playing or paying for. When progress is teased, players are much more likely to stick around to see what happens. Want your game to monetize? Then make sure players are engaged socially within your game! 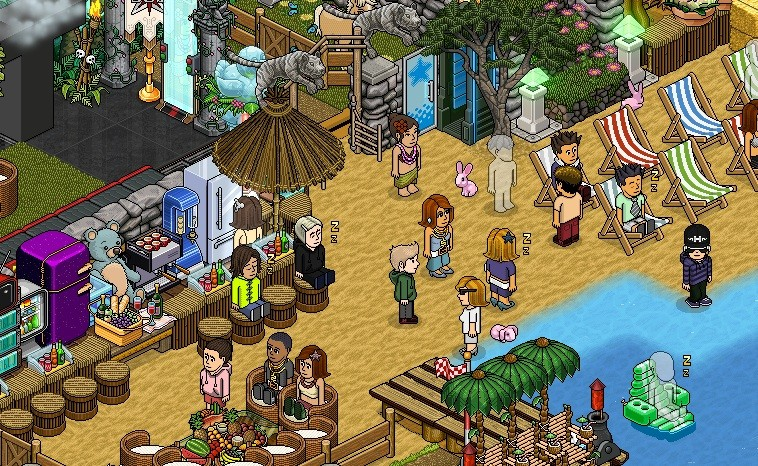 It is not a coincidence that MMOs like Habbo Hotel (pictured above) monetize so strongly with a core interactions that are quite simple. The deep social interactions that are possible in Habbo Hotel pull players in over a long period of time. Because of this strong social connection, players put a much higher value on looking good, showing off their progress and helping others. As a result players play longer and pay more money. So when you’re thinking about monetization, make sure that you have truly defined what is going to be pulling players through the game on the long haul. Ensure you have strong visual progress mechanics that show off the player’s progress and tease the late game. Ensure that you have social mechanics which give real value to the content that you’re creating. If players have minimal desire to progress, then it doesn’t matter what monetization tricks you have — they won’t play long enough to spend. You can see that Steps 1, 2 and 3 don’t really talk directly about monetization. There’s not much about skipping timers, VIP programs, limited time offers or designing virtual currencies. It’s because all that doesn’t matter unless you’ve got a long lasting game. This is really why many monetization topics usually say “think about Retention before you think about Monetization”. What the real crux of it this statement is: don’t think about monetization unless you’ve got a system that can last. Obsessing over monetization mechanics before you’ve got a long lasting system is futile. However if you’ve nailed a long lasting system that can keep players engaged for a long time, the remaining steps to monetize become significantly easier. When you’ve got a long lasting system, you can start creating mechanics that pull the player faster forward in that progression by paying or playing the way that you want them to. With enough desire to reach the end game, you can drive players to spend repeatedly to reach it. This is where true monetization begins. More on the ways to capitalize on your long lasting monetization systems coming soon!